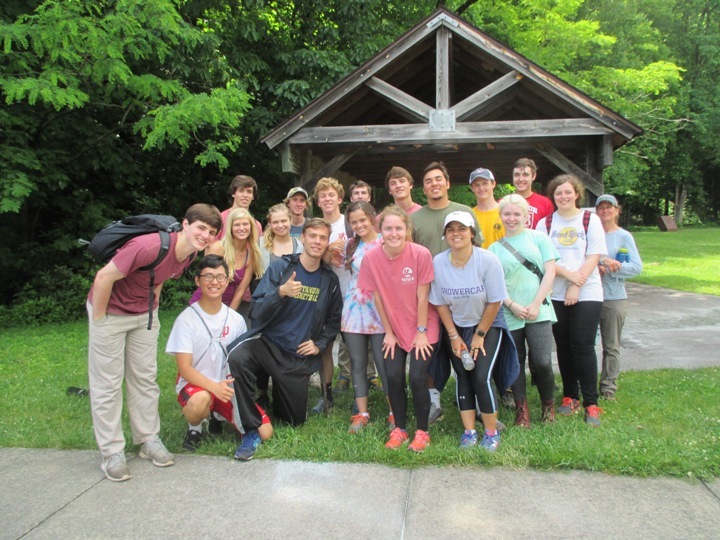 For many years the senior class at Baylor School in Chattanooga, TN has been coming to the area in and around Oconee County for a trip to enjoy such activities as kayaking, canoeing, backpacking, and rappelling. They also spend time doing community service work, primarily on the trails in the area. This year, at the end of May, 150 senior students from Baylor came on the trip and accomplished a HUGE amount of maintenance on the Foothills Trail. Each day, over 5 days, groups of 25 students worked on a portion of the trail in the area near Whitewater Falls. They carried lumber for steps and other structures, cleaned out and dug new water drains, cleared trail side vegetation, and repaired parts of the trail bed. All of this was done during the rainy time at the end of May! This group volunteered hundreds of hours during this 5 day period. They worked as many hours as our Foothills Trail volunteers have volunteered in a 5 month period! THANK YOU BAYLOR SCHOOL FOR YOUR HARD WORK!